I have traveled very little in my 20-something years. There are no exotic stamps on my passport, no photos exist of me posing in front of pyramids or the Eiffel Tower and I have yet to cross either the Pacific or Atlantic oceans. However, unbeknown to me, I only needed to cross to the other side of North America to experience culture of the international variety. While Vancouver is celebrated as a virtual melting pot of ethnicity, it’s still relatively young. There are brownstone homes in Brooklyn that are older than this city. New York City, originally founded as New Amsterdam, was first settled in the early-to-mid 1600s and has since grown into a city that straddles the precipice between cosmopolitan and historical. So many city blocks are completely saturated with what once was and still is. Nowhere does that seem more true than Little Italy. Wednesday, May 26th was a hot day – a day with the kind of heat that feels like a solid substance wrapping itself in and around your body. Rebecca and I donned slim-strapped sandals, barely-there dresses and gathered the hair off the back of our necks. It was necessary for survival. I love that kind of heat. We wove our way through narrow city streets in Lower Manhattan – the very first part of the city that was settled upon – and found ourselves in the middle of the bustling Chinatown district. Famished from walking and desperate for substance in our stomachs, Rebecca and I diverted onto Mulberry Street. Blink and perhaps you’ll miss Little Italy, a neighbourhood that’s gradually become so small yet is bursting at the seams with dignity in its roots. It’s overwhelming. A street that at one time served as the centre of the blood-soaked Five Points neighbourhood was now lined with brick veneers, fire escapes, colourful awnings scribed in Italian, delivery trucks providing everything from prosciutto to tomato sauce and flags flying with red, white and green. Older men bellowed at each other from across the street, wiping their hands on their aprons. Younger men bantered jokes in a language so fast and so beautiful that it mesmerized me. Tourists on the sidewalk noshed on cannolis and gelato. 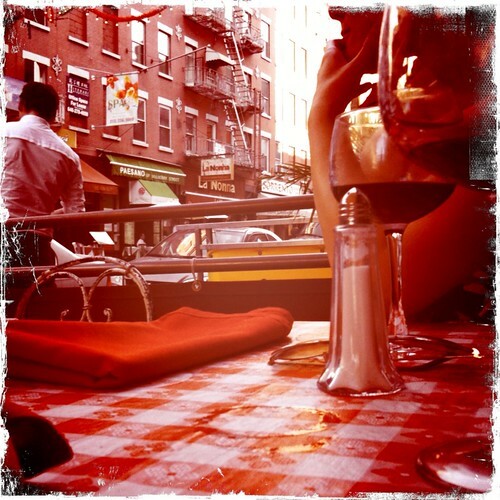 We selected a restaurant on the west side of the block, choosing to sit on the sidewalk and soak in our surroundings. Rebecca and I pushed our chairs in under the red and white checkered table cloth, my back bumping up against a flower box occupied with scarlet-coloured geraniums. I ordered a glass of house pinot noir and then fell in love. My man couldn’t have been more than a year or two older than me. Save for a few broken phrases in English, it was clear that he spoke only Italian. My man’s white shirt was chiseled around his torso and tucked into black pants that appeared to be nothing short of expertly tailored. His undershirt was traceable under his long sleeves and even in that 95-degree heat, my man didn’t break a sweat. His eyes were playful but his expression was stern and concentrated. When he wasn’t refilling our water glasses, my man was coolly leaning on a nearby parking meter with a cigarette posed between his bow-tie lips. I was infatuated and unable to look anywhere else. There on Mulberry Street, in the middle of intense heat and thrust into old-world Italy in the middle of Manhattan, I recognized that some things never change. Forever known for their remarkable dishes, perfected wine and searing passion, the Italians also have not lost their knack for invoking love at first sight either. This guy was definitely European Italian. Too bad North American Italians are now characterized by those Jersey Shore douchebags. Gorgeous writing… completely transported me! Is that ‘his’ backside you are staring at so intently? @Kat – That’s most definitely him. I wasn’t subtle at all. I love the second to last paragraph.